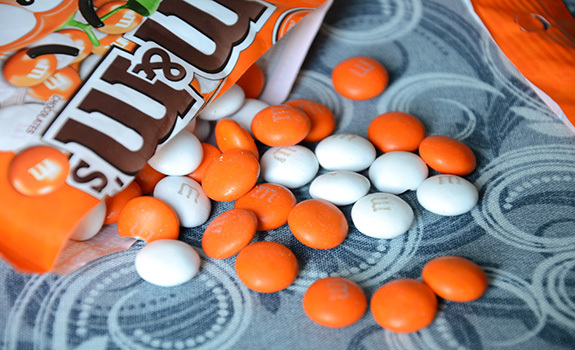 Some yummy orange-flavoured M&M’s from Australia! The first of several items from Australia that I’ll sample in August, these orange-flavoured M&M’s prove that Canada regularly misses out on interesting brand extensions in major candy and snack lines. The U.S. regularly gets these curious variants, but I’d assumed Australia was in the same boat as Canada with stuff like this. Apparently not. The Pitch: “Bite size pieces of orange flavoured chocolate coated with a thin crisp shell.” Is that a Kosher Australia symbol I see? The Look: Bright orange bag with orange and white M&M’s inside. Instead of a zip-lock top, it comes with special sticker to hold the rolled-up bag closed once it’s been opened. These seem more common with European treats than with North-American candy bags. The Taste: Snip open the bag and the orange aroma rockets out. Like M&M’s crossed with a more intense version of a Terry’s Chocolate Orange. The crunchy candy shell adds some satisfying texture. The flavour is a bit overpowering, though it’s fine in small doses. A handful at a sitting would be lovely, but I couldn’t eat much more than that in one go. I can actually feel the numbing effect the orange flavouring compound is having on my taste buds. It’s certainly going to linger. Nutrition? : Per 25 grams (8 servings per bag): 510 kJ (122 calories, I think), 5.2 grams of fat, 15 mg of sodium, 1.2 grams of protein. The verdict: A nice change of pace. If they were available at the corner store in Calgary, I’d probably buy them from time to time instead of peanut, my default M&M’s flavour.